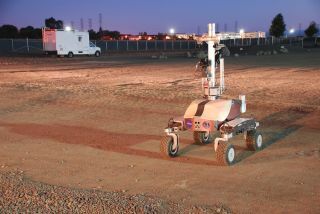 NASA's K10 rover is seen at dawn at the Ames Research Center specially built "Roverscape" in Moffett Field, Calif. The rover was remote controlled by an astronaut on the International Space Station during a June 2013 technology test. NASA transformed the International Space Station into a command center for a robot on Earth this month for a first-of-its-kind test drive of the technology and skills needed to remotely operate robots on the moon, Mars or an asteroid. During the June 17 space technology test, NASA astronaut Chris Cassidy, a space station flight engineer, remotely controlled a K10 rover at the agency's Ames Research Center in Moffett Field, Calif. The robot was commanded to simulate deploying a polyimide-film antenna in a specially built "Roverscape" at the NASA center. "We successfully conducted the first 'surface telerobotics' test session with the International Space Station," said Terry Fong, director of the Intelligent Robotics Group at Ames. "Cassidy used K10 to perform a surface site survey and to begin deploying a simulated Kapton film-based radio antenna." Fong said follow-up test sessions between rover and the space station will be conducted in late July and early August. Those sessions will focus on completing antenna deployment, inspecting the deployment and studying human-robot interaction. "We're still finalizing the date of the next test session but anticipate that it will be sometime during the week of July 22," Fong told SPACE.com. The technology demonstrations will also investigate how communication delays over large distances could influence an astronaut's aptitude to take supervisory control of a robot in the event the machinery finds itself in trouble or unable to move. The first real-time teleoperation of a planetary rover from the space station. The first real-time supervisory control of a planetary rover from the station. The first astronaut to interactively control a high-fidelity planetary rover in an outdoor planetary analog. The first use of space station and NASA data networks to connect a crew member's laptop computer to an outdoor robot. The first use of the NASA RAPID robot messaging system to control a robot from space. The test is the first high-fidelity simulation of a human-robot "waypoint" mission — an Earth-moon L2 lunar far side telescope deployment concept proposed by experts at the University of Colorado, Boulder and Lockheed Martin, builder of the NASA Orion spacecraft. NASA's K10 rover at the Ames Research Center in Moffett Field,Calif., performs a surface survey with its cameras and laser system, and then deployed a simulated polymide antenna while being controlled by an astronaut in space during a June 2013 test. "It was a great success … and the team was thrilled with how smoothly everything went," said Jack Burns, director of the NASA Lunar Science Institute's Lunar University Network for Astrophysics Research, a NASA-funded center at the University of Colorado, Boulder. The K10 rover deployed two 'arms' of Kapton film under the command of astronaut Cassidy, Burns said. Burns is a leading advocate of a proposed piloted mission to the Earth-moon L2 position, from which astronauts within an Orion spacecraft would remotely unfurl a low-radio-frequency antenna on the moon's farside. In the future, we plan such a deployment on the far side of the moon, where the Kapton film will be the backbone for a low-frequency radio telescope,” Burns told SPACE.com. Once deployed on the lunar landscape, Burns said, an array of unfurled polyimide film could track down the "cosmic dawn" of the universe that occurred shortly after the Big Bang. The moon's farside is a radio-quiet locale in the inner solar system, allowing for sensitive observations of the first stars and galaxies that formed only 100 million years after the Big Bang, he said. Leonard David has been reporting on the space industry for more than five decades. He is former director of research for the National Commission on Space and is co-author of Buzz Aldrin's new book, "Mission to Mars – My Vision for Space Exploration," published by National Geographic. Follow us @Spacedotcom, Facebook and Google+. Original article on SPACE.com.